The last time I went to Wales I was much younger and somewhat shorter than I am now. At a guess, I’d say it’s nearly fifteen years since my last visit. Back then, when I was a mere boy, my parents used to take me to the Sun Centre in Rhyl to go swimming and enjoy the Welsh seaside. I have fond, yet faded, memories of this time and now, as an adult with his own automotive transport I thought I’d go back with my camera to take a few photographs. Truth be told, the main place of interest during this road trip was the seaside resort of Llandudno. I spent most of the day there, lapping up the sunshine, occasionally moaning about the ridiculously high humidity and shooting plenty of photographs. Llandudno is a truly beautiful seaside town and photographing it’s stunning landscape inspired a much needed revival in my personal photographic work. However, you’ll have to wait a little longer to see some of the shots I took as (for now at least) I’d like to share this photograph I took later in the day while in the seaside town of Rhyl. This is one of my favourite photographs from the entire road trip as it was a spontaneous and fleeting moment that I’m ever so happy to have captured. Taken from the beach, it shows a Father playing with his two sons on the promenade. With plastic toy guns in hand, they pretend to shoot one another against a backdrop of storm clouds and fortified concrete. Personally, I feel that a number of contrasting, yet aesthetically pleasing, elements really came together when I pressed the shutter to take this image. It’s both sinister and playful; which suits me just fine. If you like what you see please support my photography and tell you friends about it. You’ll find share buttons below and I’d be delighted if you could take a minute to share your favourite photographs from this post. 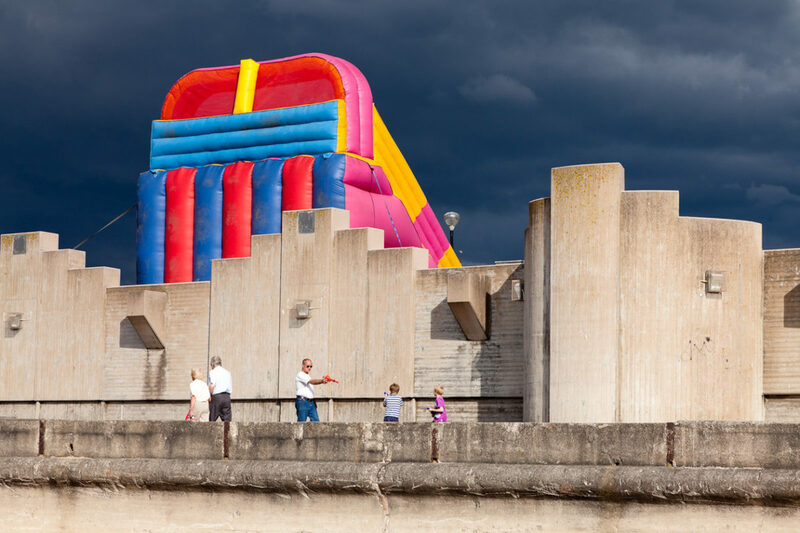 This entry was posted in Travel and tagged Candid, Coast, Photography, Rhyl, Seaside, Wales.